School of Business students Jessica Martin, Emily McCoy, Alannah Owens and Ciara Riddick spent 10 days researching sports, arts and business culture in Madrid, Spain, as part of their business management study abroad course with Patrick Mulvihill, D.Ed., visiting assistant professor of business. 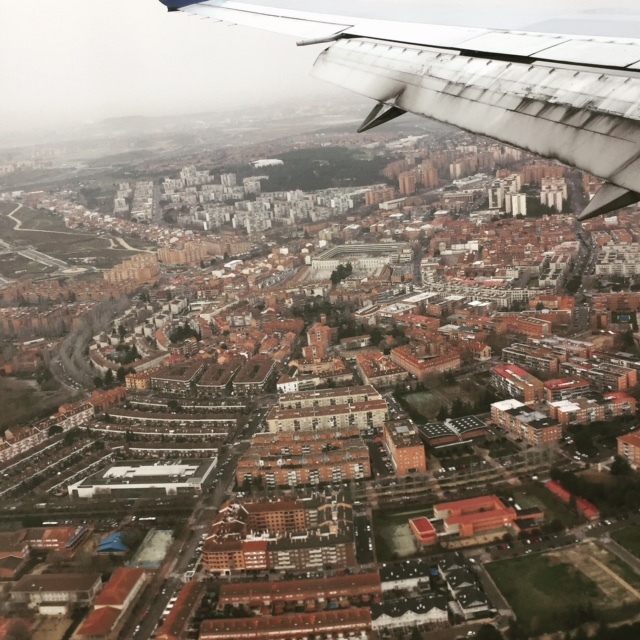 "Our students traveling to Madrid over spring break was more than a chance to experience a new culture. It was an opportunity for them to move beyond the classroom to undertake comparative research specific to their major and career goals," Mulvihill said. Human Resource Management Instructor Sandra Mervosh, M.S., SHRM-SCP, SPHR, accompanied the students on the trip. "The students quickly adjusted to the new culture, ordering at restaurants in Spanish, navigating the metro system and appreciating the new cuisine. We engaged in conversations analyzing the differences between cultures. I am very happy I was part of the experience," Mervosh said. Related to their research, Martin attended a futball match at SantiagoBernabéu Stadium, McCoy watched Spanish Flaminco dancers perform and Owens and Riddick visited several businesses in the city including the Madrid Destino Tourism Office and 2btube Studios. "This was a wonderful experience and opportunity to study abroad. I was able to apply what I've been learning in the classroom and compare it to an entirely new culture," explained Martin, a senior sports, arts and entertainment management major from Brentwood High School in Pittsburgh. "I learned a lot about the culture in Spain and the way companies differ from those here in the United States. Going into another culture and experiencing something different than what I'm used to was an eye opener and helped to expand my knowledge about the world," said Owens, a junior human resource management major from Pittsburgh Science and Technology Academy. Other highlights of the trip included a walking city tour of Madrid, a day trip to a castle in Segovia, a Spanish cooking class, visits to Prado Museum and Antonio de Nebrija University and more. "Study abroad opportunities like this allow you to see just how open you are to new experiences. I enjoyed going beyond my comfort zone," remarked Riddick, a junior accounting major from Lake Taylor High School in Norfolk, Va.
"My favorite part of the trip was getting to see all of the sites in Madrid and Segovia — and the food. Spanish food is incredible. Meals are meant to be an experience, often lasting for hours," explained McCoy, a senior SAEM major from Bishop Rosecans High School in Zanesville, Ohio. McCoy added: "Overall, the most beneficial part of the trip was just getting to be immersed in another culture for 10 days. Experiencing a different way of life from your norm helps you grow as a person in so many ways." Explore the undergraduate majors in the School of Business and learn more about study abroad opportunities at Point Park University.